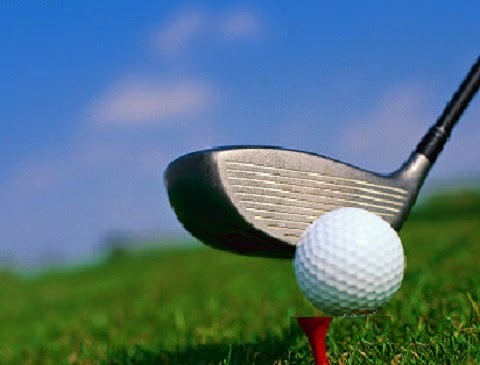 A player makes a practice swing close to his teed ball and accidentally hits it, moving it 100 yards down the fairway. A player makes a stroke at his teed ball and completely misses it (a ‘whiff’, or ‘fresh air’) but the ball topples off the tee. A player makes a stroke at his teed ball and his clubhead just touches it knocking it off the tee. The player picks-up the ball and re-tees it. A player addresses his teed ball and accidentally knocks it off the tee as he grounds his club behind it. A player addresses his teed ball and completes his backswing for a stroke, but as he begins the forward movement the ball falls off the tee; he is able to abort his stroke, swinging over the ball without touching it. Ruling: No stroke has been made and no penalty incurred. The ball has not been put in play, so the player must put a ball in play from anywhere on the teeing ground. Definition of Stroke. A player addresses his teed ball, completes his backswing and as he begins the forward movement of his swing the ball falls off the tee; he tries to abort his stroke, but tops it forward a few yards. Use the 'Search This Blog' box towards the top right hand corner of my blog pages if you have any questions on the Rules of Golf. On a windy day a player addresses his teed ball and completes his backswing for a stroke, but as he begins the forward movement he sees the ball quivering and he thinks it might fall; he is able to abort his stroke, swinging over the ball without touching it, however the ball drops. It is impossible to say for sure if the "whiff" of air from the near miss was a contributory factor to the ball dropping. This did happen to me on a windswept Scottish link course under match play conditions and my playing partners allowed me to re-tee the ball without penalty. But was this the correct outcome? No penalty was incurred in the circumstance that you describe and the player could play his first stroke on the hole from anywhere within the teeing ground. The player did not intend to hit his ball, so it does not matter whether it was the rush of air from his club that caused the ball to move, as it was not in play; similar to accidentally hitting the ball with a practice swing. I have a playing partner who addresses his putt then takes a practice stroke over the top of the ball. I cannot find a rule directly talking about this, but I believe it may be a penalty under 16.1-e. Can you clarify? Presuming that you mean that the player takes a practice 'swing' over his ball and not a practice 'stroke', no penalty is incurred by this action, providing the ball does not move after the address, which does incur a penalty of one stroke under Rule 18-2b and the ball must be replaced. In a similar vein I think I found a seventh possibility! What happens if you accidentally knock a provisional ball (original ball possibly lost in jungle rough) off the tee!? The following assumes the original ball will not be found after going and searching for it: Play it as it lays provisional 4, re-tee it free-of-charge and then hitting provisional 3, or re-tee it under a penalty of one stroke and then hitting it provisional 4? If a free re-tee was permitted but in the confusion was played as it lay (just infront of where the tee was and still WITHIN the teeing ground, how would the score be accessed? I am not sure that I fully understand your hypothetical scenario. If a provisional ball is accidentally knocked off the tee it is not in play, as no intended stroke has been made at it. If the ball lies outside the teeing ground the player would incur a penalty of two strokes if they played it, Rule 11-4. Unless they find their original ball, or play another ball from within the teeing they are disqualified. If the ball that was accidentally knocked off the tee happened to remain in the teeing ground and it was played from there, the player could continue with that ball, which lies 3. What if you take a practice swing off a tee box and the dirt from the divet knocks the ball off the tee? This happened to me in a match. It was obvious i was not addressing the ball and i was plenty far away from the ball to where the club did not strike the ball in any way, shape or form. They let me retee with no stroke or penalty against me. What should the official ruling have been? You correctly advised, as should have been obvious from the blog. A ball on a teeing ground is not in play until a stroke has been made at it. Your practice swing was not a stroke, so the fact that the divot you made caused the ball to move means that the ball can be replaced without penalty. A friendly word of advice, you should not make divots with practice swings on a tee box. Always move to the side of the tee box to avoid damaging the surface. Would the following constitute a stroke please? Player tees up ball, addresses ball, commences swing to drive ball, but ball falls off tee peg and club only hits tee peg, missing the ball. Player then re-teed ball and drove it off. Did the initial swing count as a stroke? Because the player intended to move their ball (i.e. they did not intentionally abort the stroke), it counts in theior score and the ball must be played as it lies for the player's second stroke (Definition of Stroke). Correct. Under Rule 27-1 you are permitted to play from where you last played from under penalty of stroke and distance If the last stroke was from the teeing ground you are permitted to tee the ball anywhere within the teeing ground. Your next stroke is the 3rd. Can a golfer do a test swing in an *Set up Position*? What i meant by *Set up Position* is that the golfer is prepared and addressing in front of a Teed up ball. Is that test swing counted as a stroke played? Because the golfer was already in a set up position. Part of the Definition of Stroke states that it must be made with the intention of striking at and moving the ball. So, in the circumstance that you describe, the ball has not been put in play with the practice swing and no penalty is incurred. The player may re-tee the ball anywhere in the teeing ground.